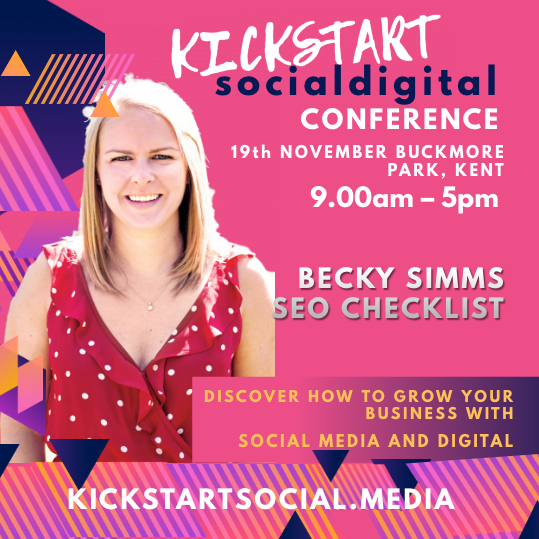 Kickstart's SEO speaker, CEO and founder of Reflect Digital, inspiring female business leader and foodie Becky Simms answers 4 questions giving us insight into what's important to focus on with Digital Marketing. I am Becky, CEO and Founder of Reflect Digital. We are a full-service digital agency based in Maidstone, over the last 7 years we have grown to a team of 24 and I am so proud of our awesome team. My day to day role is hectic, everything from leading the team to our own business strategy, through to inspiring our clients regarding their strategy. I love to be creative and have a belief that everything we do must have a purpose, so I love working with clients on their campaign goals with this in mind. Paul, my husband, is our COO, we have two cats, Bear and Izzy, and our dog Harry is Chief Happiness Officer at Reflect. He is a dachshund cross with a spaniel, he is amazing and so integral to the team! One of my passions in life is food, dining out at restaurants from backstreet small restaurants to Michelin star is definitely a favourite activity of mine. I also love cooking, walking Harry, reading, aerial hoop (I am often covered in bruises!) and spinning, a 6:30 spin class is a great way to start the day! What is the most important piece of advice you can give to businesses about Digital Marketing? Track everything, the most valuable part of digital marketing is the ability to know what works and what doesn’t, but you only get that if you have the right tracking set up. So at the start of every project, we ensure we consider what we want to be able to track and how those measures work in line with the overall business goals. By thinking about tracking early in the process you can ensure this is built in at every stage and not an afterthought which often comes too late and the data has been missed. What are the biggest mistakes that businesses make with SEO? Sadly there are many mistakes happening all the time with regards to SEO and my talk will try to combat as many of these as I can. I would say site migrations tend to be the problems we see time and time again. Moving a website should not mean a loss of visibility and therefore traffic if it is planned and completed correctly. So often redirects are forgotten which just makes it so much harder for the search engines and ensuring the technical setup of the website has considered SEO is an absolute must. What could a reader go away and action right now that could make a difference in the way they market their business online? Making time to read and then to reflect on your own strategy and the results you are seeing will enable you to consider what you should be implementing next and should allow your strategy to continually grow. How can readers get in touch with you if they have any questions?